If you’re interested in purchasing a home in 17402, 17401, 17403 or any of the nine zip codes that encompass the city of York, contact the local real estate experts at CENTURY 21 Core Partners at (717) 718-0748. Based in neighboring Springettsbury Township, we have a strong understanding of the entire York real estate market. Our listings of York, PA homes for sale include numerous single- and multi-family homes, townhouses and condos in various sizes and price ranges. Located in South Central Pennsylvania approximately 20 miles from the Maryland border, York is the eleventh-largest city in Pennsylvania. With a population of approximately 43,000, York is large enough to offer a wide range of modern amenities, yet small enough for individuals who prefer a slower pace of life. 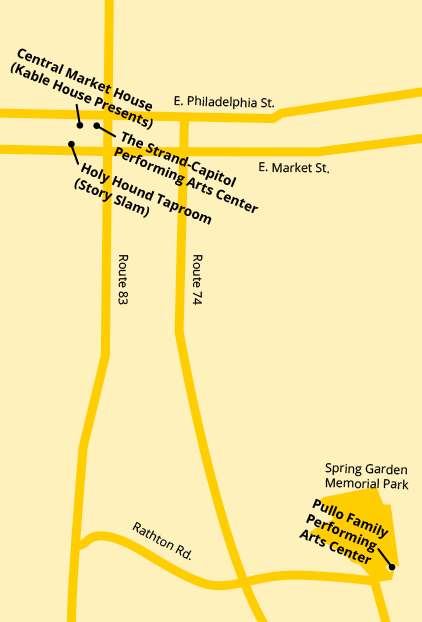 York is also within easy commuting distance of the capital city of Harrisburg, PA and Baltimore, MD. York played a prominent role in the early development of the United States. York is sometimes referred to as the first capital of the United States, because the Articles of Confederation, the forerunner of the U.S. Constitution, were drafted and adopted by the Second Continental Congress in York during the Revolutionary War. York was also the first northern city to be occupied by the Confederate army during the Civil War. Why Move to York, PA? Walk down a York County street or through a market and you will find plenty of people ready to share with you their favorite things about the area. If you’re moving to York, PA, there is much to consider. Don’t worry about finding a local to uncover the hidden gems of the area. We’ve got you covered. York County weather. From warm summer afternoons to snowy winters, York County weather is ideal for those who like to enjoy all four seasons. Grab your inner tube and float down a creek during the hot and humid days of summer, cozy up with a scarf in the crisp days of fall and settle into winter’s chill as you watch the snow leave just enough fluff behind to satisfy a couple of days’ worth of sledding. When spring returns to York County, the temperatures are pleasant and welcomed. It’s like the whole area shakes off the cold of winter and gets ready for another cycle of York, PA weather. A sense of community. Whether you live in the close-knit borough of Hallam, the walkable streets of Dillsburg or the farm country of Shrewsbury, York County offers a diverse and unique sense of community. Many people relocate to York, PA to escape the bustle of nearby larger cities. Those who commute to Baltimore, Philadelphia or Harrisburg for work come home to York County in hope of fleeing the rush of their workday. Whether you grew up in York County or decide to start fresh here, you’re sure to find a welcoming community. Once a town that lost college graduates to bigger cities, York County is becoming a place where young professionals and their families stick around. New opportunities, affordable living options and an exciting entertainment scene make York, PA a great place to live. 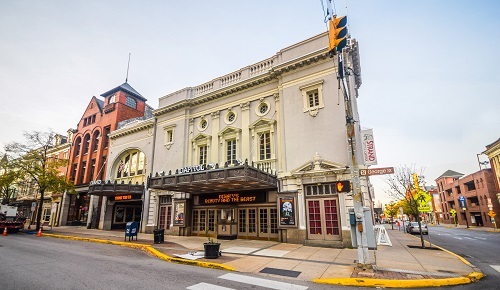 Once you settle into your new home, you will want to find things to do in York, PA. From historical theaters to busy farmers’ markets and unique boutique shopping, there’s a variety of options available. The Strand-Capitol Performing Arts Center. Purchase a ticket at the old-school counter and head inside to watch a live theater performance, hear the York Symphony Orchestra or transport yourself to a new setting during a Sunday movie showing. This historic theater captures audiences with its beautiful ceiling art, unique showcase options and rotating events. York Story Slam. Dive into York, PA culture with a visit to the latest entertainment option: York Story Slam. With the first event kicking off in January of 2016, the creative minds of downtown York have created new ways to support innovation and inspiration. Visitors can contribute a 5-minute story during each themed event. Don’t expect a theatrical experience. There are no notes, props or instruments allowed — only your words and the microphone. The Pullo Center at Penn State York. From comedy to live musical performances and educational demonstrations, The Pullo Center at Penn State York is a great way to connect to the York, PA culture scene. World-renowned artists have stepped onto this stage to perform for audiences of students, community members and corporate leaders. Check out the campus and in-house café to see what beautiful educational opportunities York, PA has to offer. Kable House Presents. Nestle in to a seat near the front of the house to see what Kable House Presents has to showcase in its latest season. Welcoming traveling musicians, Kable House Presents sets up stage in Central Market York to provide entertainment from artists you might otherwise miss. This quiet, casual atmosphere provides a great place for people to settle in with a snack and a beer from Mudhook Brewing Company (located behind Central Market). Take a couple hours out of your busy day and unwind under the creative tunes of some of the area’s hidden talent. Other events: An experience you won’t want to miss in York, PA is the Harley-Davidson factory tour. The “Legends in the Making Tour” takes visitors behind the scenes at one of only four manufacturing facilities for Harley-Davidson vehicles in America. To get more up close and personal, ask for the Steel Toe Tour. Speaking of bikes, you can’t miss bike night in York. And don’t forget about the York Fair every fall. If shopping is up your alley, there are plenty of York, PA businesses that offer unique wares in a thriving downtown and suburban atmosphere. Put on your walking shoes and grab a few bags – you’re going to find plenty of treasures. Shops on Beaver and Market streets. Visit downtown York for a day of shopping as you settle into your new home. Grab a soft pretzel and draft root beer at York City Pretzel Company, 39 W. Market St., before heading next door to My Girlfriends’ Wardrobe for unique consignment options. Around the corner on Beaver Street, you’ll want to wander into Watchmaker’s Daughter to browse unique, handmade jewelry. Next door is Park Street Pantry, where you can satisfy your taste buds by sampling unique olive oils, spreads and spices. Across the street is Elizabeth and West, a women’s clothing boutique with the latest in trend-setting fashions. If it’s Tuesday, Thursday or Saturday, pop into Central Market York to buy fresh produce, baked goods and sit on a stool at one of the many lunch counters. Grey Beards Antiques and Collectibles. Make the short drive to Jacobus and lose yourself in the four floors of antiques, collectibles and housewares that fill Grey Beards Antiques and Collectibles. Take a break from browsing to grab a latte at the in-house café and warm up with a homemade bowl of soup. Make sure you have plenty of room in your car to take home a new treasure. Hain’s Pipe and Cigar Shop. A true gentleman’s hangout, this historic smoke shop at 225 S. George St. is a hidden gem. Jesus Casatnon, a native of Cuba, hand rolls cigars made of a variety of tobaccos, including pre-embargo Cuban tobacco. Enjoy a cup of homemade coffee or BYOB to enjoy an afternoon of stogies while you lounge on the couches inside the shop. You’ll meet some interesting characters in Hain’s Pipe and Cigar Shop, including police officers taking a smoke break, business men going over contracts and Jesus’ father-in-law, who will tell you a story in Spanish if you have time to listen. If you’re worried about where to do your banking in York, PA, don’t worry — you’ve got plenty of options. There’s a Members 1st Federal Credit Union at 2420 Mount Rose Avenue and a First National Bank on 135 N. George St. The real “bankers row” in York, however, is E. Market Street, off of which you’ll find a People’s Bank, Wells Fargo, BB&T and M&T. You’ll also find numerous PNC Banks throughout the city, including ones on W. Market Street, Carlisle Avenue and Roosevelt Avenue. For farm and market fresh produce, meats and other goodies, head to Central Market House on 34 W. Philadelphia St., or try Brown’s Orchards & Farm Market at 8892 Susquehanna Trail South in nearby Loganville. One of the best selections of organics in York County is Leg Up Farmers Market on 3100 North George Street, York. Another great option is New Eastern Market. There are tons of great shopping opportunities in York. To unearth some real treasures, head over to the Dover Antique Mall at 5010 Carlisle Road in nearby Dover, or choose from some beautiful candles, jewelry and other gifts in beautiful surroundings at Christmas Tree Hill – In the Mansion on 2840 Whiteford Road. For more traditional shopping opportunities, head to the York Galleria at the intersection of Route 30 and Route 24 or the West Manchester Town Center at 415 Town Center Dr.
All of those activities are going to leave you hungry. Thankfully, York Countians know how to eat. Whether you crave a comfort meal or a fine dining experience, there are plenty of options to satisfy your growling tummy. Bel Paese Italian Restaurant. It’s easy to drive past Bel Paese in Springettsbury Township and not even know it’s there. Nestled in a small strip mall, stepping inside the restaurant is like being transported to your Nonna’s kitchen. Order from the wide range of pasta dishes, fresh gnocchi and in-house sauces that will have you booking your next visit before you leave. Mix things up with a homemade pizza or choose from the many desserts showcased in a display rack near the entrance. The Left Bank. This downtown eatery is a York County staple for special occasions. Make a reservation for a table in the dining room or squeeze in at the bar to sample small plates and classically prepared cocktails. 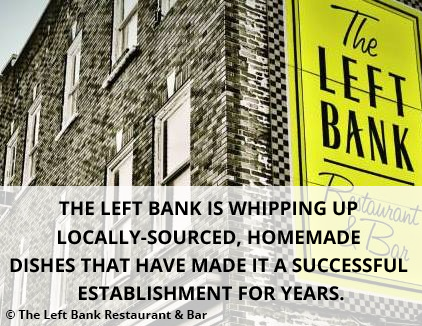 Whether you’re hungry for steak, seafood or something more inspiring, The Left Bank is whipping up locally-sourced, homemade dishes that have made it a successful establishment for years. Roburritos. If you’re craving something a little more casual but certainly filling, make a trip to one of several Roburritos locations. Whether you’re in Dallastown, West York or inside Eastern Market, one of these monster-size burritos will leave an impression. Make a return trip to try tacos, homemade guacamole or nachos piled high with every topping imaginable. Other Places: Where you’ll go for a taste of York depends on what kind of dining experience you’re in the mood for. For a casual, classic American meal, there’s Bogey Macaws American Grille on 601 Chestnut Road or Alexander’s Family Restaurant Pit BBQ & Lounge at 840 Carlisle Avenue. Or for a slightly more upscale experience, BrewVino on 251 N. George Street offers hand-crafted pizza, fine wine and craft beer. If you’re in the mood for fine dining, the Left Bank Restaurant on 120 N. George Street can be an unforgettable experience, or you may want to try the Oak Restaurant at Heritage Hills on 2700 Mount Rose Avenue, overlooking the Heritage Hills Golf Course. Want to try something new? Check out Rockfish Public House on 110 N George St. When you’re thinking about moving to York, PA, schools might be on the top of your list if you have children or hope to start a family soon. Thanks to a growing range of academic options, there are plenty of public and private schools. With three colleges, five technical and vocational schools, 17 public school districts, three charter schools and four private schools, there are plenty of options. York Suburban Senior High School ranked 75th in the state for its proficiency in college readiness, math and literature. Other school districts, including West York, Central York and Northern York have produced high-test scores and competitive sports programs that continue to push students in excellence — both academically and athletically. York is home to York College which offers over 50 bachelor degree programs. It is also home to Penn State York Campus where more than 160 Penn State majors can be started, as well as HACC York Campus, serving over 3,000 students in the local area. York, PA is ideal for outdoor fun. Try Codorus State Park in nearby Hanover with its 3,500-acre recreation area for boating, camping and more, or visit Samuel S. Lewis State Park at 6000 Mount Pisgah Road for a variety of fun outdoor recreational activities. You could call many places home when you move to York, PA. Whether it’s the convenience and walkability of a city home or the rural quiet of a country house, there are options that can meet many tastes when you consider places to live in York, PA.
York City. There are plenty of affordable housing options in York City. Stay close to the action of downtown and be within walking distance of bars, restaurants and shops while you settle into a townhouse with historic charm or newly renovated, modern features. Springettsbury Township. Home to the York Galleria, numerous restaurants and several shopping centers, Springettsbury Township is the place to be if you want to be close to it all. You’re also just a hair closer to Lancaster County, in case you want to zip away to the outlets for a day of shopping or visit friends. It’s enough to York City that it’s convenient to swing downtown for dinner and a show, but it provides quieter living for those seeking a more suburban lifestyle. There are many York, PA real estate options on this end of the county. Hanover. On the west side of the county, Hanover offers small-town living in a historical area. Close enough to Gettysburg and York, Hanover is a tight-knit community nestled in the rolling hills for which Pennsylvania is famous. Plus, it’s a great place to get a taste of York County’s snacking side, with the UTZ chip factory and Martin’s chip factory within close driving distance. There are plenty of York, PA homes for sale in Hanover as you plan to relocate. Shrewsbury Township. If you plan to commute to Baltimore for work, as many York County residents do, then settle in close to the Maryland border with a country home in Shrewsbury Township. This quiet town is known for its quaint community events and cozy atmosphere. Spend your weekends apple picking at the nearby Brown’s Orchard or settle in for a night around the bonfire and watch the stars shine. It’s also a great town for getting into the seasonal tradition of summer blue crabs, plucked fresh from the Chesapeake Bay by local fishermen. Red Lion. Whether you want to live in the heart of the borough or you prefer to settle on the quiet outskirts, this community offers the comfort of a caring area that’s ready to welcome newcomers. A great place to raise a family, Red Lion features several parks, community-centric events and area businesses that make socializing in Red Lion a breeze. Check out the Red Brick Bakery for an afternoon cup of tea or swing by Black Cap Brewing Company for a post-work craft beer. Use our website to simplify your search for homes for sale in York, PA. You can target your search within the city simply by entering a zip code or MLS number. You’ll find lots of detailed information about properties that interest you, including prices, full-color photos, square footage, taxes and more. When you download our mobile app to your smartphone or tablet, you’ll also be able to stay up-to-date on the status of our houses for sale in York, PA at any time — whether you’re at home, at work or on the go. The Internet is a valuable tool for anyone looking to buy a home in York, PA, but it takes a competent real estate agent to make the purchase go as smoothly and seamlessly as possible. All CENTURY 21 Core Partners agents are well-trained and highly qualified, and are committed to serving the best interest of our clients. As a leading Century 21® franchise, you can count on CENTURY 21 Core Partners to uphold the proud Century 21® tradition of superior customer service. Century 21® received the highest numerical score from first-time and repeat home buyers in the J.D. Power 2016 Home Buyer Seller StudySM. To learn more about our York, PA real estate listings, give our office a call at (717) 718-0748 today. If you’d like to take a closer look at our York, PA homes for sale, visit one of the many open houses we hold in the York area every weekend.